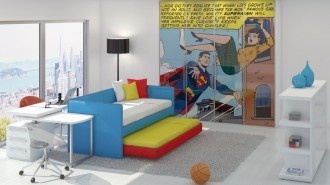 I’d love to speak to the designer of this room to find out if it’s for a comic book enthusiast, child/teen or what?! I understand that just because I don’t get it, doesn’t mean others won’t like it. What do you think? What do you think about this design? Please leave a comment above the “What?! Wednesday” banner; where it says “Leave A Comment” in orange and on our Pinterest page in the Huh?!? section. My brother would Love this room LOL and he’s 37! Thanks for stopping by again. Yeah, I think a lot of comic books enthusiasts would like this space. Stay tuned for this Wednesdays “What Do You Think?” Design! Thanks again for chiming in!